Deliverance is a timeless classic, perhaps because it's a story as old as time: man against nature, and nature always wins, even if nature is man in his natural element. Four city men head off into the wilds of Georgia for a canoe trip. The natural habitat is threatened by a nearby dam construction project; the river and its surrounding way of life will soon be flooded. Strangers and city folks are not really welcomed by the locals, especially now. The macho Lewis (Burt Reynolds), the introvert Ed (Jon Voight), the fearful Bobby (Ned Beatty) and the guitar-playing Drew (Ronny Cox) wade into territory much more hostile and dangerous than they can imagine. Soon they tangle with in-bred, rifle-wielding hunters. Bobby is victimized, the canoes capsize, another of the men is killed, Lewis is humbled, and Ed has to find his inner strength just to survive the ordeal and get back home in one piece. John Boorman keeps the tension building in gradual but unfailing increments. There is tension among the four men, tension when they first meet the locals, tension when the adventurers first take on the river, tension when they tangle with the murderous, violent hunters, tension in the subsequent frantic escape down the river, and tension to explain away the whole ordeal to the local town-folk. The only break comes early with the famous guitar / banjo duel between Drew and a local boy, and even that ends with a creepy breakdown in communications that ominously hints at what is to come. Burt Reynolds gives a performance that hints at what his career may have achieved had he pursued more serious role opportunities. Voight, Beatty and Cox memorably portray everyday men thrust into foreign territory they are ill-equipped to deal with. The other star of the movie is mother nature, Boorman and his cinematographer Vilmos Zsigmond delivering a masterful job capturing the interface zone where humans closest to the wild reside. 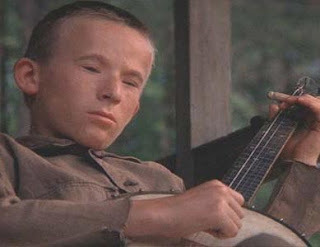 A morality tale on how nature can always fight back, Deliverance puts man back in his place.